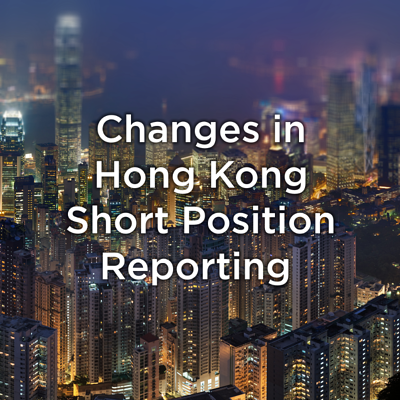 The Securities and Futures Commission (SFC) is expanding the existing short position reporting requirements in Hong Kong. Effective from 15 March 2017, the new provisions will cover all securities that can be short sold according to the Trading Rules of The Stock Exchange of Hong Kong Limited (HKEX). The amendments mean that reporting will be required for all Designated Securities eligible for short selling as specified by the HKEX. The current thresholds for disclosure remain unchanged - it is the lower of HK$30 million or 0.02% of the value of the total number of the specified shares (after 15 March 2017, designated securities) issued by the corporation concerned. However, for collective investment schemes, only the threshold of HK$30 million is applicable. The Hong Kong regulator made a great effort to prepare investors for the upcoming changes by granting a generous notice period, running a pilot test of the Short Position Reporting Service from 11 January to 10 March 2017, as well as publishing various documents helping understand new disclosure requirements. You still might need FundApps though. Until 15 March 2017, SFC is responsible for updating the list of specified securities and publishing the revised version on its website, as well as notifying the subscribers via e-mail in case of any changes. After 15 March, however, the SFC will stop publishing a list of specified shares on its website. From that date, the list to be monitored will be the list of Designated Securities published on the HKEX website. As you may have expected, the data provided is in .CSV format, which probably means even more manual work for you. Here at FundApps, we automatically check that list for our clients and assign ISIN codes to each security to ensure a better match, making it much easier to stay compliant. If you would like to read more on how we do it, check our blog post on sourcing data for Hong Kong Takeover panel disclosures. Our automated data sourcing scrapers run multiple times per day, examining the Hong Kong short-selling list and dozens of other lists (new ones are constantly being added). With everything fully automated, there is no room for missing an important disclosure or filing an incorrect report due to mistakes made while manually checking lists published by regulators.